Classic Torso is a 31"x49" vinyl bag, featuring an envelope-style zipper construction and 3 identity tags. 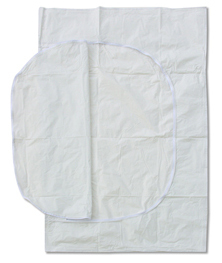 This bag is also available in the Classic PEVA format for a cremation safe alternative. Classic adolescent bags feature envelope-style zippers construction and 3 identity tags. Our Infant Bag is available in four sizes and a variety of materials. The PEVA and POLY materials do not contain PVC and are cremation safe. Primary Application: Crematoriums frequently use the 12"x26" PEVA and the 20"x41" PEVA mortuary bags because they are chlorine free and burnable. The other two styles are used by customers such as coroners and medical examiners.